On Sale Now! Free Shipping Included! 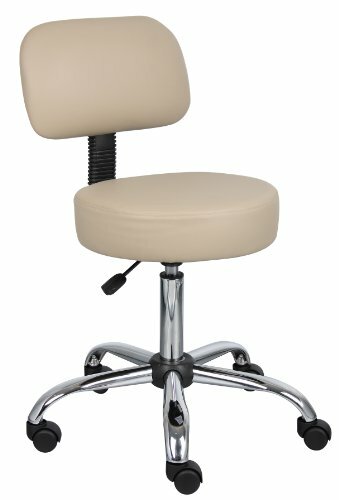 Save 3% on the Boss Office Products B245-BG Be Well Medical Spa Stool with Back in Beige by Boss Office Products at Momiji Studios. MPN: B245-BG. Hurry! Limited time offer. Offer valid only while supplies last. Fashioned with dual wheel casters, the Boss Beige Caressoft Medical Stool With Back Cushion easily moves from one area of the room to the other. Fashioned with dual wheel casters, the Boss Beige Caressoft Medical Stool With Back Cushion easily moves from one area of the room to the other. Users appreciate the ergonomic design that works with the spine to reduce stress and improve comfort. The seat and back are made using Caressoft vinyl upholstery, which is not only attractive in appearance, but also easy to clean in between appointments. The height of the seat is adjustable with a 6" range using the pneumatic gas lift. In addition to this model with the back cushion, users can also purchase model B240 if no back cushion is required. Ergonomic design emulates the natural shape of the spine to increase comfort and productivity. Weight Capacity: 250 lbs.